Idea Cellular, the country’s third largest telecom operator, added maximum 26.37 lakh subscribers in September month, to take its overall base to 16.65 crore, followed by India’s leading telco Airtel, which added 22.28 lakh users and took its base to 23.52 crore, as per data shared by Telecom Regulatory Authority of India (Trai). Vodafone, the country’s second largest telco, added 15.93 lakh to take its base to 18.81 crore. BSNL added 10.48 lakh users to take its bases to 7.96 crore, followed by Reliance Communications, which added 4.35 lakh customers. Aircel added 2.47 lakh users in September. Telenor added 2.31 lakh subscribers, while MTNL added 10,544 subscribers to take its base to 35.98 lakh at the end of September. Tata Teleservices added 2,719 new users and its base stood at 6.20 crore. Sistema Shyam Teleservices lost 75,455 users, reducing its base reduced to 83.60 lakh. The country’s total telephone subscriber base increased to 102.26 crore at the end of September, against 101.41 crore at the end of August, Trai data revealed. The country’s wireless customer base increased in the month of September at 99.66 crore, up from 98.81 crore in August. The monthly growth rates of urban and rural wireless subscription were 1.37% and 0.16% respectively. The fixed line base declined to 2.59 crore in September from 2.60 crore in August, Trai data revealed. 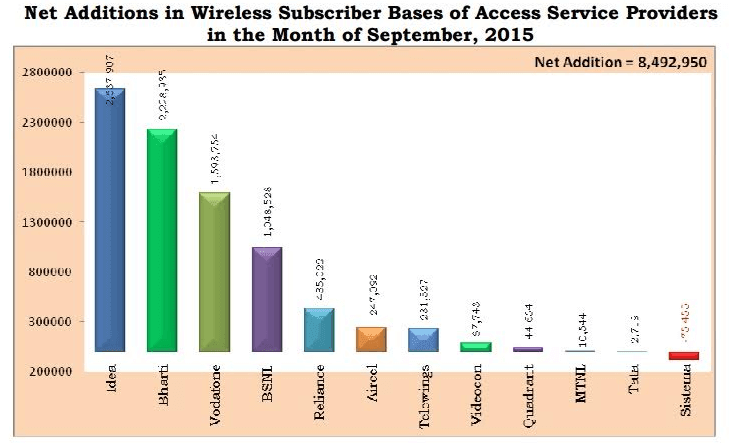 Out of the total wireless subscriber base 99.66 crore, 89.3 crore wireless subscribers were active on the date of peak VLR in the month of September. The proportion of active wireless subscribers was approximately 89.67% of the total wireless subscriber base. The overall tele-density in India increased from 80.40% at the end of August 2015 to 80.98% at the end of September 2015. The urban tele-density increased from 151.01% at the end of August to 152.76% at the end of September, whereas the rural tele-density increased from 48.62% at the end of August to 48.66% at the end of September. The shares of urban subscribers and rural subscribers at the end of Sep-15 were 58.58% and 41.42% respectively, Trai data said. Trai said that 41.7 lakh users submitted requests for mobile number portability (MNP) in September. With this, the cumulative MNP requests increased from 17.22 crore at the end of August, 2015 to 17.63 crore at the end of September, 2015. 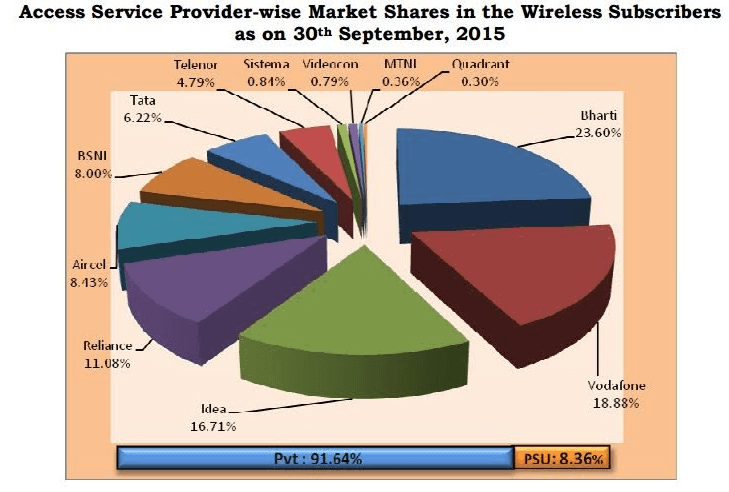 As on September 30, the private telecom service providers held 91.64 per cent market share of the wireless subscribers. State-run BSNL and MTNL held only 8.36 per cent share, the regulator said.